Last year was a year of discovery, venturing into the world of weaving. It started with the purchase of two vintage looms (read about all that here). Weaving is both beautifully simple and complex. There has been a lot of experimentation.Learning through trial and error. This post is an update on progress so far. 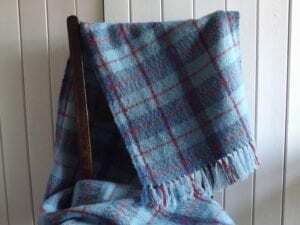 The rigid heddle loom is basic, weaving only plain (tabby) weave. But it is simple and relatively quick to warp. It is small and portable, making it possible to weave front of the telly. 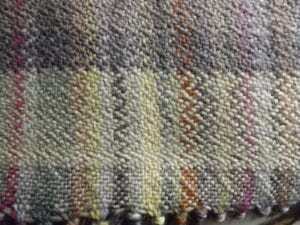 Playing around with colours in the warp and weft can create an infinite number of check designs. The weaving itself is straight forward. 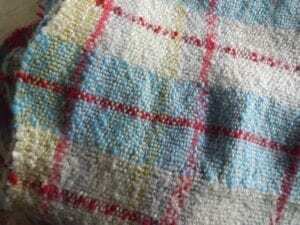 The main issue has been with the behaviour of different yarns during the finishing process. ‘Wet finishing’ is a tricky process. There is a large stash of DK (superwash) merino around here, which is great for the weft on this loom. (the warp is 4 ply superwash merino, also from the stash). 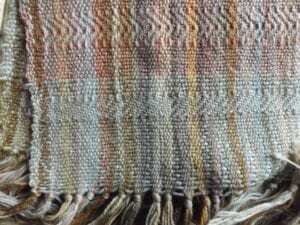 Although it is all essentially the same yarn, some colours shrink far more than others in this ‘finishing’ wash, requiring a lot of stretching into shape and resulting in somewhat wobbly weaves. Not perfect – but very wearable and a nice, vintage feel. And when the yarn behaves nicely the results are very good indeed. You’ll find some on the website here. The lesson here is ‘know your yarn’. The 4 shaft Weavemaster table loom was more daunting initially. Not so much the weaving itself, it is ‘dressing the loom’ (that is getting the warp onto the loom) is by far more fiddly and prone to mistakes. Once the warp is on the loom the rest is more or less plain sailing. There was a happy accident early on. Rather than buy in more yarn, the leftovers from sock making went onto the loom for the first weaving experiments. And from the word go the results were promising. All these small amounts of naturally dyed yarn blend so well together. 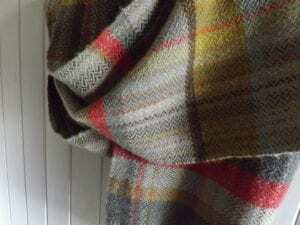 This is a ‘sampler’ scarf, experimenting with some of the different weave patterns possible on a 4 shaft loom. However different weaves can result in wobbly selvedges, and using the same weave throughout result in a more professional look. The finishing process was much less problematic after a little trial and error. ….and are on the website here. The only problem is making enough, as they use the ‘leftovers’ from sock making there is only so much yarn available.